Yeah, little Fiona has a brother now: Egon ! Time is so fast!.. I had already posted a photo of Fiona's birthcard two years ago. And, Suzanne, very kindly, has sent me the birthcard of Fiona's two-week-old brother by mail. I found the card veery lovely with that cute baby-carriage and spring motifs on it :) I really love this birthcard tradition !!!!! "We are resting between 12:00 and 15:30"
So, the name "Egon" was relatively very popular till the end of 80's; then suddenly became a not-preferred name somehow. The one in Javaplein, I first saw when I visited Kaustubh in his old house at Ceramplein. Noticing its tower and its extraordinary architecture, I thought it was an arab-style mosque, with that tower being its minaret. 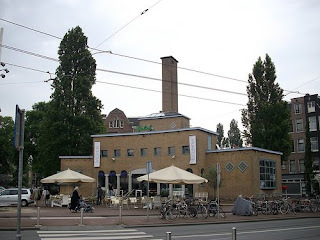 The photo is from a blog by Kees; from his entry entitled "a € 29.95 brain"
Later, I noticed the label "Bad Huis" on it, which I knew to mean "bath house". More interesting was to realize that there were people inside having drinks etc. This made me think that I probably was wrong to translate "Bad Huis" since it does not make sense to name a restaurant as "Bath House". Then, Maikel the saviour helped me :). I summarized him all this one day and asked him what "Bad Huis" meant. To my surprise that place was really an old public bath house of Amsterdam, which has later been converted to a restaurant. It was really weird to me. I thought there was no bath houses at all in europe; with it being a tradition in Turkey (hamams), or in other asian countries.. I have made a search on internet but I could not bump into any detailed information. I only learned that it was a municipal bath-house, where the poor would come for their weekly shower (look interesting!). This info made me think that it was really in old times (eg. a century ago). But somewhere else, it says that it has been built in 1942, which is notably recent to me. I still wonder the reasoning behind to build such houses in the city. Was it like having water in their houses was a luxury for the poor at the time? Labels: Maikel taught me something again..
Yeah, I know how tiring struggle it is to search for a house in Holland. I listened hunting stories from Olja; later I have witnessed many such attempts of my bosses Margriet&Age.. And now; for the last 5-6 months I have been reading the adventures of Tjeerd and Nina via their blogs. tens of houses are checked from inside or outside before you can find "the one". after a certain point, the hunters get into a desparate mood: "we will never be able to buy a house" they say to colleagues, friends. If there are more than one hunters for the same house, bidding is used to choose one of them. The one with highest bid gets the house. There is always a case where the hunters get depressed to lose a loved-house because of their lower bidding offer. The checked houses always have something to be fixed & repaired. So, while making a bidding you have to also take into account the additional expenses you will make for such repairings etc. "it must be in a central place; but rather must have a yard with some green stuff" is one of the very popular initial requirements for the dream-house. You must be in contact with one or several realtors during the hunting, asking for appointments to see the house. Construction inspector is another guy with a must-contact. (S)he will inspect the house of interest and inform you on how much to spend in order to fix the things. What I did was to scan Nina's and Tjeerd's blogs to exemplify those common things. This would be a nice tutorial for the expats of Holland who wants to buy a house, I thought. "This was the seventh house we viewed on the inside, out of the 25 houses we viewed from the outside. I think three more to go, so the tenth house will be it! " says Nina in her post titled "House 7". "Tjeerd thinks we will never find a house we both like and that is still available when we find out about the house. " says Nina in her post titled "And SOLD again...". "Since several months we are looking around for houses just outside the city. Some houses are sold within a week, other houses are for sale for over six months. But every time when we call a realtor to make an appointment to view a house, we got the answer: “We just sold that house yesterday". "We hope that the woman can’t get the mortgage for this house of course. This may sound evil, but it’s our only hope." says Tjeerd in her post titled "Househunting: too late part two", a post he made after they learned that the house they were interested in was sold to one other hunter. "Unfortunately, the seller of the house didn’t like our condition about the construction technique, so he chose the other couple and they will get the house. Of course, it’s a pity that we didn’t get this house, because we really liked it" says Nina on her post titled "the house we didn't get"
"Now a colleague of Nina has won the bid on the house. A big pity that we didn’t get the house, because there were actually no negative things about the house (location, inside et cetera)." says Tjeerd on his post titled "Next"
"But the house belonged to an old lady and there are many things that has to be fixed or renewed. " says Nina on her post "House hunting 2: Maarn". "all the windows and window frames need to be renewed! And the draining in the kitchen isn’t connected to the sewage system yet. So the costs we did calculate for this house will be doubled! And that’s really way too much." is from Nina's another post: "House hunting goes on". Nina talks about the "Realtor World" with a surprised-angry mood: "It’s a world we can’t see from the inside, so we just have to believe what the people in this world tell us. And that’s hard, because the news they tell us isn’t very believable." she writes. "Tomorrow it’s “Open Houses Day”: many houses that are for sale open their doors, and you can visit these houses without making an appointment". says Nina on "House sold" post, feeling happy that they do not have to deal with any realtors..
"I sent an e-mail to the realtor to confirm the appointment, just to be sure. I got an automatic reply from him. It said: "I don’t work as a realtor anymore". What!?" says Nina, very surprised on her post "Realtor Mystery". "Well, we know which contractor we will definitely not hire for the modernisation if we buy a house. Why not? They promised us to give a costs calculation last Friday in the afternoon, or else definitely last Monday. We didn’t hear anything " says Nina on a post titled "Waiting, waiting, waiting!" "This contractor advertises with being the cheapest, but that can’t be true. We found out that it’s cheaper to hire a carpenter, an electrician and a plumber, instead of a contractor who arranges everything for you." says she on her othe post: "Contractor and Realtor"
Yup, they have finally managed to get a house few weeks ago, afterd facing with bankrupt realtors, dying owners and some other adventures. You can read how they are happy about this via Nina's post "Our new house" and Tjeerd's post "Our new house"
They even have a new blog for the new house www.dorpsstraat52.nl. 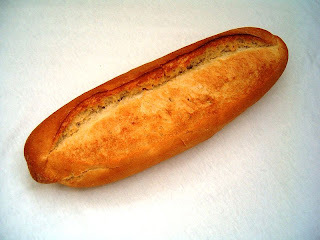 One of the biggest problem I faced in Holland in my first weeks was to find a tasty bread. I have tried some among a flock of varieties sold at AlbertHeijn in vain: they were really bad in taste to me.. Actually, I didn't think that I would have a bread-problem in Holland since I had managed to "detect" a very tasty bread in Netto when I was living in Denmark, a country with a very similar supermarket profile. In my first wisit to the bakery, I was SO happy to spot our pide there. Pide is a special turkish bread with a very different shape compared to the traditional one. It is special since it is only sold in the bakeries in Turkey during the month of Ramadan, the fasting month. I really LOVE its taste, I always questioned why it would not be made available throughout the whole year. One of my worries during my fasting time in Holland was to be away from my lovely bread, pide. That's why I felt like the happiest person in the world when I saw pides being sold at Kardaş Bakkerij. "the bread torture is over" I cheered up. The biggest surprise came later, after Ramadan was over. I was again at Kardaş Bakkerij, and to my surprise I saw they were still selling pides. "How come?" I asked "Ramadan is over". And one of the employees there told me "pide is sold throughout the year here in Holland under the name of "turkish bread". How hapy I was! I enjoyed eating pides happily during my stay in Holland whenever I wanted ..
Then I left the country, and my military service started; and soon it was the next Ramadan. And unfortunately we were not served with any pides at the military unit. Having fed myself with pide for 1 year in Holland, it was really sad to miss the 1-month-pide opportunity in my own country.. So, I have preferred to switch to this somebody's blog instead; and it turned out to be an indian lady living in Holland; ~Lopa. A post in her weblog about a notice at her office has caught my eyes. Although it is Dutch, it is not that difficult to get it: "this is not the reception" it means to say. By the way, I have just noticed myself appearing on this photo on the window, trying to take this very photograph :) . "It is not also a mirror" it says :D. I can imagine how the employees working in this glass-walled office felt when people outside were trying to use their windows as mirrors. I live in Turkey now, but love to post things on dutchy things still. Maikel taught me something again..